Supporters of the government’s order point to incidents involving faith healings gone wrong and other disruptions of the peace. The army of Cameroon has been ordered to attack Churches. According to Tapang Ivo Tanku of CNN, the government’s action against the Pentecostal churches has not only already taken effect, but also will expand. 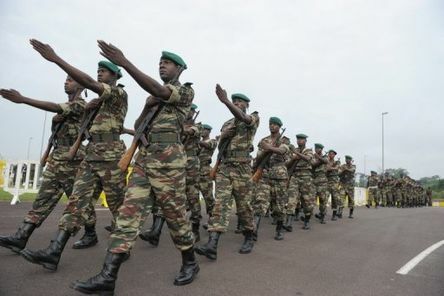 “Biya is using the military to permanently shut down all Pentecostal church denominations in the nation’s capital, Yaounde, and the North West Regional capital, Bamenda, which have the largest Christian populations in Cameroon,” wrote Tanku. First: The Governments should permit cults and sects to operate freely, based on Freedom of Religion. As long as there is no violence involved. This is an example of persecution of Christians. But I have to admit, that sometimes Christians are their own worst enemies. By permitting false teachers and false prophets to operate, the enemies of Christianity gets fuel to attack true followers of Jesus the Messiah. There is no easy solution to this problem. Many Christians have been martyred, because of crimes committed by false brethren. Non-Christians will not be able to see the difference and execute both true and false Christians. Paul has given us a warning, which is followed by few of us. – Do not have anything to do, with people who claim to know Jesus the Messiah, but by their words and deeds make a mockery out of the true faith. you are right Ivar! The so called church of today with their many profane books of apostasy, abominations on TV evangelism do not like ‘Born Again’ Christians. They do not want fellowship with us. They want to entertain goats with wild music for big money. Those types of churches will close down because of God’s judgement. Good churches will have to go underground. The one world religious system is well underway-in Geneva again! “Most assuredly, I say to you, he who does not enter the sheepfold by the door, but climbs up some other way, the same is a thief and a robber. But he who enters by the door is the shepherd of the sheep. To him the door keeper opens, and the sheep hear his voice; and he calls his own sheep by name and leads them out. And when he brings out his own sheep, he goes before them; and the sheep follow him , for they know his voice. Yet they will by no means follow a stranger, but will flee from him, for they do not know the voice of strangers.” John 10:1-5. False teachers are pretending to care about the sheep. Let those churches die that are not true shepherds of the sheep, but hirelings! Who are filling their pockets-they are the thieves and robbers, having their consciences seared with hot irons! Pharisees! Thank you Lord for the gift of your Son Jesus! Jesus is the gift, acceptance of the “Free Gift” is salvation. For God so loved the world that He Gave His only begotten Son, that who so ever Believes in Him shall not perish but have ever lasting life. John 3:16 Amen! in the article there was this sentence ….(smile)…. And anyone who has every met Jesus can not sit still still, or be quiet even if they just kneel and cry at his feet for his abundant mercy and love for them…! The false brethren I do not cry over, unless they repent to Jesus for leading the true born again believer’s astray and persecuting them. We are suppose to avoid false brethren. The Lord will repay this evil. For Christ did die for them as well, only until they repent they are using His name in vain. Look how when the Apostle Paul when he met Jesus turned his life upside down from a Pharisee to being Christ’s servant and spreading the gospel, and writing scripture by the Spirit of God. Instead of persecuting the believer’s he led heathen to Jesus, even Roman soldiers! The Lord used Him mightily! How awesome is our Lord!! you list the use of Saul by Jesus who was persecuting the believer’s he led heathen to Jesus, even Roman soldiers! The Lord used Him mightily! How awesome is our Lord!! Grow up Sweetheart…give the Holy Spirit more time to show you what a truly mighty God we really have in us..whether we lay in pain or stand on a stage and preach His Word to multitudes or write in an office under the anointing of the Spirit of God to many who will reap the exact thing they will need in their lives years from now or that was written many years ago as in His Word we receive that Balm of Gilead each time in His Word is read and received….your love of our Lord is a great help-mate for many let it continue to grow and give strength to yourself, praise to our Lord and to others. Paul repented! He saw Jesus! Not all of them will repent, but they still need to hear the truth from us. I am a bothered by the false brethren (false teachers, false prophets, false witnesses Matt. 7:15, 24:11, 2 Peter 2:1), though they are not my brethren (teachers), others call them brethren (pastor/teachers) because they in the churches. Just because you go to church does not make you a ‘born again’ Christian (or pastor/teacher). I have a dear sister who I love but we disagree. She follows after a man (pastor/teacher) and not after Christ. The false teacher-pastor she follows is the one who I wish would repent for leading my sister away from the Lord. I don’t care about him (Galatians 1:8&9), I care about her and the ones who believe him. Where I live his ministry is reaching far and world wide (and not his only), and you see it seems they are all connected to each other. They forward each others books, and teach the same lies. They have lying signs and wonders, claiming to bring people back from the dead, yet where are the dead men that are now walking???. She believes this man can do these things without the evidence. What the Lord wants is for me and for you to share the gospel. The ‘true gospel’! We are not saved because someone tells we are, like the pope says even atheists can go to heaven. We are saved because God sent His Son Jesus to pay the penalty for sin. The penalty for sin is death, and Jesus paid it! Jesus is the ‘gift!’ (John 3:16, Romans 5:15) By faith we believe it and we are saved forever, we receive the gift of the Holy Spirit! How will they know unless an evangelist is sent (Romans 10:15, Matt. 4:21)? But even if we, or an angel from heaven, should preach to you a gospel contrary to what we have preached to you, he is to be accursed! Galatians 1:8. I am not very smart I admit and I will never be grown up until I am with Jesus, and even then I shall be learning. I have been told that in Isaiah 53, the Jews think it is about them via the Holocaust. They don’t realize it is about their Messiah Jesus who died on the cross for their sins and ours as promised in Genesis 3:15. We need to get the gospel out to the Jews, first and foremost! The “Jews” are not a group of people who disagree on almost all matters. Also related to who and what the Messiah might be. Some Jews says there is a Messiah in every generation. Others say “He” is a set of beliefs. I have also heard that the suffering Jew, fits into Isaiah 53. That the Messiah is the summary of the collective suffering of the Jewish people. Why do the Jews not read Isaiah 53? Is it not a good place to evangelize from? Unbelief causes blindness. Why read something that makes no sense. Ivar stated the things that Jews say about that passage of scripture. They obviously don’t understand its meaning. Unbelief causes this. I disagree. By reading God’s word it will open their eyes. That is how I was saved, by reading God’s word. They are all not blind. There are Jews being saved every day just like the Gentiles. Sometimes it just takes a little prompting. Romans 11:23-25. If they are told by the Rabbi’s not to read Isaiah 53, how will they know what is in there. They only know what the Rabbi’s tell them, just like what all other religions do (Roman Catholicism come to mind). They need to seek it out for themselves. God will make himself known to those who diligently seek him. If a person does not know they are lost, then they won’t ask the questions, like I was, but someone came along and challenged me who God sent. That is how God does it, He sends disciples out. How then shall they call on Him in whom they have not believed: And how shall they believe in Him of whom they have not heard? And how shall they hear without a preacher? And how shall they preach unless they are sent? As it is written: “How beautiful are the feet of those who preach the gospel of peace, Who bring glad tidings of good things!” Romans 10:14&15. There is a small remnant for which we need to seek to save. Amen! in Jn chapter 5 Vs 39 in his dialogue with Jews about who he is and how he and the father are deity he makes a statement. He says this” you diligently study the scriptures because you think that by them you posess eternal life. at that time the only scripture was the old testament or the Old covenant scripture. Then he says “These are the scriptures that testify about me, yet you refuse to come to me to have life. The implication here is that just the study of scripture does not bring eternal life. Along with the study their must be faith or belief. Without belief in the scripture a person cannot see God. God is the one who causes a person to believe. Many that were following him at that point began to fall away even after seeing and witnessing the miracles he performed. Why would the fall away with incredible evidence that he showed. They simply did not believe and continued in their blindness. Unbelief causes blindness. We don’t know whom God is drawing in but know that he is drawing people in. In his drawing he is opening eyes and ears. That is why we must tell them and show them in his word the truth. Correctly you quoted the passage from Romans how will they hear without a preacher. Its interesting that he says a few verses later that your hope is in Moses.They believed him. He says if you believed Moses you would believe me, for he wrote about me. But since you do not believe what he wrote, how are you going to believe what I say. We must pray that God will cause Jews to believe what he says or said then they will accept him and have life. It is the same for anyone. Unbelief causes blindness. Only God will lift the blindness and the deafness. Amen Todd. They do say they believe in Jesus, but which one are they talking about? The jesus of Rome, the jesus of Mormanism, the jesus of Hindu’s who believe He is one of the gods, and of any number of the cults. Catholic’s believe in a jesus the one in the eucharist and still hanging on their cross, but not in the Bible. They don’t need the Bible. I used to say, “I believe in Jesus” just like them. Praise God he waited for me. How awesome is our God! First we need to ask what they believe and then we can tell them the truth, if they will hear, which most will not I am afraid. The Lord will give us opportunity’s though, I am thankful indeed! Thank you Todd for the conversation. Psalm 111:10! These churches need to be closed,the pastors who run them are not even Christians,just Idiots who make a living out of preaching nonsense,these churches have absolutly nothing to do with Christianity or God. They need to close them all,throw old car tyres over the so called pastors,add petrol and set them on fire.